Yesterday morning I walked into my garden and discovered the tomato I thought was a Polish Linguisa, turned out to be a Yellow Pear Tomato. Despite the surprise, I am actually pleased. I love the flavor of the Yellow Pear Tomato. Plus, I have a Roma, which is quite similar to the Polish Linguisa. 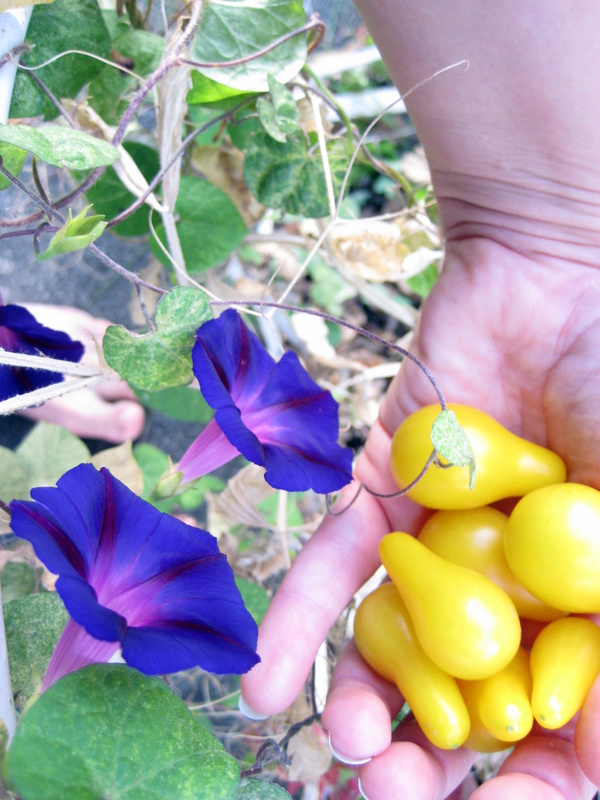 I had just a handful of ripe ‘maters which were a delightful burst of sunshine in my mouth! What a great way to start my morning. While I’m sharing a bit of my garden harvest, I also thought I’d share my progress on my latest knitting project. 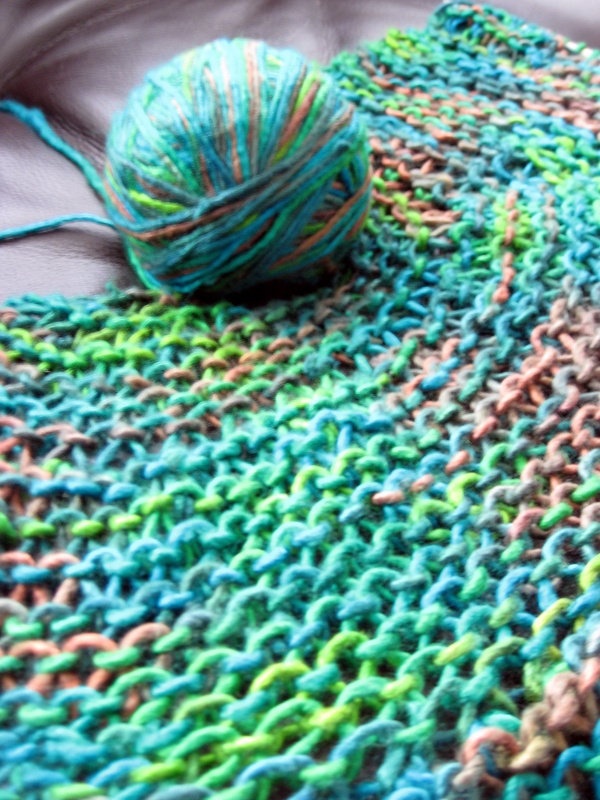 I’m working on a wonderful pattern, which is free by the way, called the Storm Cloud Shawlette, by Hanna Breetz. It’s a lovely pattern that is rather quick to knit up. For yarn, I’m using a gorgeous silk single by T R Designs which I picked up at Sock Summit. The sheen is simply marvelous and the colors are so brilliant it makes my mouth water just looking at it. You might think I’m a bit silly, but I’ve been carrying this with me everywhere! When I’m a desk jockey (read: working in Corporate America), I put it next to my monitor and pet it every so often. Wonderfully, it calms and inspires me. La la… happiness is knitting in brilliant colors! I haven’t had good luck with the taste of yellow pear tomatoes. Alas. My cherry tomatoes are really tasty this year however. 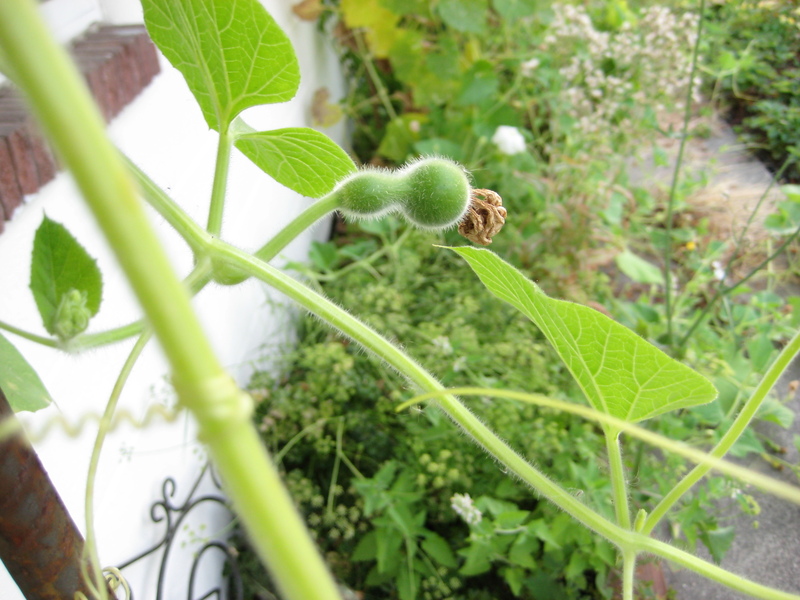 And speaking of morning glories – we had to move a lot of dirt in our back courtyard this spring and it disturbed ALL the seeds and ALL the annuals that had seeded and were lying in wait EXPLODED into repopulating everywhere. The main exploder – the morning glories. Very pretty but I’m a bit worried about what next year will bring!